Given their direct impact on the health and quality of life for millions, inhalers represent a major turning point in the history of modern medicine. Inhaler devices: Fundamentals, design and drug delivery provides readers with an introduction to the fundamentals of inhaler technology, with a comprehensive discussion of the history of inhalers as well as a discussion on current research and development. Part one discusses the fundamentals and development of inhaler devices as well as drug formulations for inhalers. The treatment of asthma is also discussed. Part two reviews recent developments in drug formulation and nanotechnology for inhaler devices, emerging inhaler technology and possible future trends. 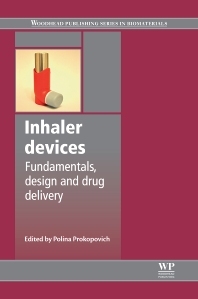 Inhaler devices: Fundamentals, design and drug delivery is an essential design guide for good industrial practice, and will be an invaluable resource for those researching and treating conditions such as asthma; and those developing and manufacturing inhalation devices. Dr Polina Prokopovich is a Cardiff Academic Fellow in the School of Pharmacy and Pharmaceutical Sciences and School of Engineering at Cardiff University, Wales, UK and she is a Visiting Academic Fellow in the Center for Biomedical Engineering of Massachusetts Institute of Technology, Cambridge, MA, USA. She has an international reputation for her research in the area of biomaterials and biotribology, particularly the development of novel biomedical materials with functional properties.